Telangana State Election commission is going to conduct the Gram Panchayat Eelctions in the month of June/July 2018. In view of these Elections Telangana State Election commission has released an another Hand Book for those official who are participating to conduct these elections in the District & Revenue Division level. TRAINING 300 DISTRICT RESOURCE PERSONS (DRPs) @10 FROM EACH DISTRICT, BY THE SEC. TRAINING RETURNING OFFICERS STAGE I AND II BY THE DRPs AT DIVISION LEVEL. CO-OPTION OF ABOUT 20 TALENTED ROs FOR TRAINING THE PRESIDING AND ASST PRESIDING OFFICERS (POs AND APOs)AT SUB-DIVISION LEVEL. TWO TRAININGS FOR THE POs AND APOs AT SUB-DIVISION LEVEL, FIRST AT SOURCE CENTRE AND THEN AT DESTINATION CENTRE. 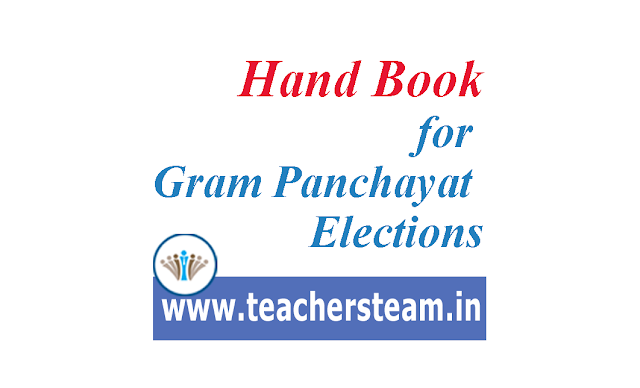 Under Rule 3 any officer of the local authority or the Government may be appointed by the Collector and District Election Authority to do any act or perform any function in connection with the conduct of elections for one or more Gram Panchayats. The Returning Officer is responsible for overseeing election process from the stage of publication of election notice under Rule 5 of conduct of election rules to till the declaration of the results. To establish Returning Officer’s office. Issue of public Notice of Election under Rule 5 of conduct of election rules. Uploading the nomination details and affidavits filed by contesting candidates in Te-Poll software in the official website of TSEC: “tsec.gov.in”. Publication of list of nominations received daily.